I've been limping along with a 2008 Macbook. I put a hybrid SSD inside. I put in 6GB of RAM. I tried a full SSD but I must have picked a bad brand or perhaps it was defective because the Agility 4 sent my Macbook to pinwheel kingdom. I was happy to be back on the hybrid SSD. Then I got iOS 6 and shared photostreams. I really would like to manage them from my main machine not just my phone. And that means Mountain Lion. Of course, there's other reasons for me to want ML but shared photostreams is certainly one of them. I've been trolling he refurb list at apple.com. 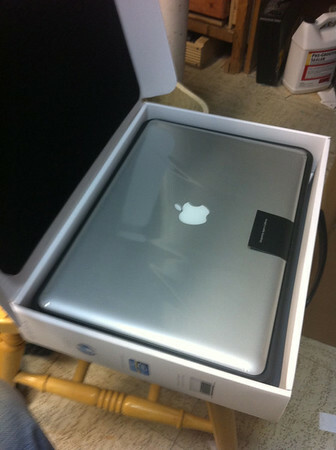 I found the anti-glare MBP from 2011 for $1800. It used to be over $2000. It was tempting. Sort of. Then I wandered in to Microcenter and saw the same machine for $1599. Wow. That's $200 cheaper than an Apple refurb and this one is new in box, eligbile for Mountain Lion up to date, full warranty and everything. I was tempted last year when this thing came out but I decided I could wait. Well I waited. At 30% off, I convinced myself now was the time. MC tried to sell me an accidental damage policy for $450. That would have wiped out the money I had just saved so I told them "no thanks". I also picked up 8 GB of DDR3-1333 RAM but I'll wait a few days to crack my machine open and put it in. Microcenter also had 2 lower priced models on sale for $1399 and $1299 respectively but they were sold out today when I went to pick mine up. I had several criteria in mind. I wanted quad core for faster performance during video transcoding and facial recognition. I wanted to avoid any "bottom feeding" since that has led to me owning several Macs that can't run Mountain Lion. In a few years, I'm sure Apple will cook up some new secret sauce to kick the cheap machines "off the island". Another thing I wanted was the new trackpad. I've been living with the pre-multi-touch trackpad for a long time and every time I play with the trackpad on somebody's newer Mac or in the Apple store, I'm convinced it's better than what I deal with now which is an external BT mouse. So far, I've got mixed feelings about the trackpad. I keep reaching for the mouse. If I want to drag something 4000 pixels from the right edge of the internal monitor to the left edge of the external monitor, I run out of trackpad but I've found I can put another finger down and just continue. The three finger swipe to get into and out of mission control is something I've wanted to have as well. And two finger swiping right and left to switch browser tabs is really nice. One thing I noticed is this thing runs hot. Well perhaps it's because Spotlight is busy indexing but the fans were running full blast until I decided to look for a way to get the thing up off my wooden desk. I found a nice laptop "cool mat" at Target for $19.99 but I thought that would raise the thing too high. All I think it needs is 1/8 inch to get away from the wood which is an excellent insulator compared to air. I found two paint stirring sticks and put them under the left and right edges of the MBP and the fans got quiet within 15 minutes. I found that iPhoto found 500 photos of my wife and daughter in less than half the time it usually takes. Very nice. Little Snitch forgot its registration but the rest of my software seems to be working. I opened LibreOffice and it opens a lot slower than it did when I ran it from the hybrid SSD in my old Macbook, but once it was open it was stinking fast. And the two finger scrolling horizontal and vertical is to die for. How can anybody do without multitouch? So now that I've sunk my assets into this MBP, I have to grit my teeth and bear with my iPhone 4 and walk past all those iPhone 5's without looking. That's ok. I don't feel the need to "knee jerk" upgrade or I wouldn't be going from a 2008 Macbook to a 2011 Macbook Pro in 2012. I did have a rather unpleasant experience with iOS 6 today. It reminded me why some people decide turn their backs on Apple. We were at Michael's and my wife wanted to download the free Michael's app. On Android, downloading a free app is a no-brainer. No login. Nothing to think about. Just click and it's yours. Not on iOS. Not even iOS 6. She had to log in. It turns out she had never logged in since upgrading to iOS 6. It got worse. She had to create the 3 security questions before it would let her download the free app. What a crock of BS. I'm happy that Apple is able to protect it's IP from shameless copying but I'm also happy that Apple has viable competition in Android. After all it was Android and the jailbreaker community that brought us folders, wallpaper, multitasking, app updates without password entry and so on. But in moving to my new Mac, despite my momentary frustration in the store this afternoon, I was keenly aware of one thing. I didn't want to dig for or re-enter any shareware codes and I knew that was always a risk when moving to either a new HDD or a new machine. So far, I've had to only enter one. As OSX becomes more like iOS, while the walled garden is something I don't want to deal with on the desktop, software regisration is something I would rather not think about either.